Uber quietly raised $US2 billion through a secretive bond offering last week in which it had to turn money down. Credit markets are hot as the ride-hailing company races toward an initial public offering next year, with one Wall Street analyst saying he’d never seen anything else like it in more than three decades. Uber quietly raised $US2 billion through a secretive bond offering last week. And while little is known about who bought the ride-hailing firm’s first debt offering, Wall Street analysts are ruminating over what the oversubscribed deal could mean for the company’s hotly anticipated initial public offering. Specifically, Reynolds points to the few facts that are known of the massive offering: The deal was three times oversubscribed, meaning Uber had to turn away potential buyers, or at least limit how much the participating investors were able to buy. Strong demand also helped the larger of the two tranches – $US1.5 billion of eight-year coupons – see its yield sink 50 basis points and its price surge to above $US102. “That is akin to a hot IPO surging after the pricing in a weak overall tape,” Reynolds continued. Uber is eyeing a public offering as soon as next year. The company could net a whopping valuation of more than $US120 billion, The Wall Street Journal recently reported. Wall Street banks, at least one of which floated that $US120 billion number in a presentation, are circling like sharks to be part of the massive offering (and netting the lucrative fees banks take home for bookmaking on IPOs). At the same time, Uber is still struggling to slow its cash burn and shake off a bad reputation it garnered under the leadership of Travis Kalanick, the founder who departed as CEO last year. 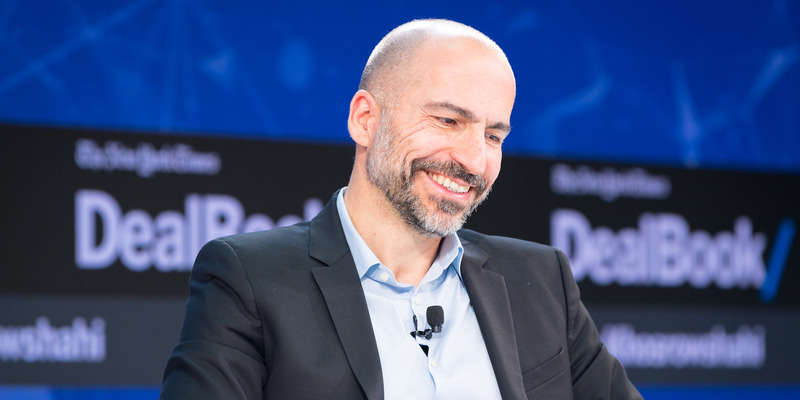 Now a year into Dara Khosrowshahi’s tenure as CEO, some of the identity crises are still playing out. Cameron Poetzscher, Uber’s head dealmaker since 2014, resigned on Monday. Poetzscher, who oversaw deals including SoftBank’s $US8 billion investment into the company, had previously been accused of sexual misconduct and received a formal warning from the company last year, The Journal reported. Uber’s closest competitor, the much smaller Lyft, is also racing toward an IPO next year – and has already signed Credit Suisse to assist with that process. Its valuation could top the company’s $US15.1 billion valuation in private funding rounds, but that would still leave it less than one-quarter of Uber’s. So while equity markets remain frothy – the benchmark S&P 500 index is down 2% this week alone – more credit offerings could hit the market. Netflix, another headline-grabbing, cash-burning tech giant, on Monday said it planned to issue $US2 billion of junk bonds.